I’m 19 months old. I live in Billings, Montana with my two siblings – Ian (age 6) and Hazel (age 3). I love to play outside with my brother and sister and do whatever they are doing. Lately, I also enjoy playing with golf balls, running and trying to ride a balance bike. Fun story about our family: When my older brother was a toddler, my family used to yell “ground beef” during hide-and-seek because that is is what he could say at the time. Now when I play with Ian and Hazel, we yell ‘ground beef’ at each other until we are all found. 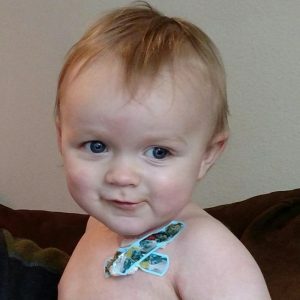 When I was 11 months old, I was diagnosed with bilateral rentinoblastoma. At first, some doctors thought they needed to remove both my eyes. Now we are being treated in NYC at Memorial Sloan and the doctors there believe they can save my beautiful, big blue eyes! My favorite Candlelighters NYC experience was when the FDNY took us around the island of Manhattan on their fire boat – thanks to Captain Steve! I got to see all the sights and play with the firefighters. I also loved my time at the firehouse where Candlelighters NYC celebrated the children. I can’t talk yet but you could see by the joy on my face that I liked all this! My parents say they like Candlelighters NYC because you feel like you aren’t alone when you have to stay in NYC. Click here to donate to Candlelighters NYC in honor of Conor.